This 2 bedroom, 1 bathroom first floor Granada apartment located at the popular Residential La Cinuelica, R1-Los Altos, which is a 10-15 minutes walk from the beach, 5 minutes walk to the local supermarket (Consum) and within 15 minutes walk of bars and restaurants. The town and marina of Torrevieja is a 10 minute drive away. The living/dining room a comfortable sofa, sideboard unit with television and a DVD player (please bring your own DVD’s), and dining table with 4 chairs. An archway to the rear of the living room leads into the kitchen. With air conditioning fitted for your comfort. The fully fitted kitchen has a fridge freezer, electric oven and hob, toaster,microwave, kettle, crockery, cutlery and cooking utensils. To the rear of the kitchen is a door leading to the utility area where you will find a washing machine. The main bedroom has a double bed, fitted wardrobes, and 2 bedside cabinets with drawers, and duvets for the winter. The second bedroom has 2 single beds and fitted wardrobes. The fully tiled bathroom has a bath, over the bath shower, shower curtain, bidet, and toilet, sink and a mirror with lights. Additional items…. Iron and ironing board and a clothes airer. The property has use of a communal swimming pool which is located behind the apartment building along with the large landscaped garden. The property has a terrace area to the front and it is equipped with table and chairs for al fresco dining. With visibility of the Mediterranean. Bed linen and 1 bath towel and 1 hand towel per person will be provided. There is a no smoking policy in this property and no pets, smoking is permitted outside. The property is suitable for couples, families, golfers. Parking is available on the road outside of the property. Welcome packs can be provided for your arrival, so you can enjoy a cup of tea/coffee of glass of wine on your arrival. Ideal especially for those late night or Sunday arrivals (outside of the summer period) when the shops are not open. Please advise upon booking if you would like this service. Walking distance from the property you have several supermarkets including: Consum, Carrefour, and Aldi. There are many bars and restaurants within walking distance, there is a selection of commercial centers, with a wide selection of bars and restaurants, providing ample choice with many cuisines available. Punta Prima is a mere 10 minute walk away, Patio Andaluz is a Spanish restaurant with lots of atmosphere and flamenco dancing 2 nights a week. The Nautilus restaurant and the Punta Prima restaurants are both sea front restaurants with stunning views, serving Tapas or Spanish La Carte menus. Torrevieja is just a 10 minute drive, with a wide variety of bars, restaurants and shops. The promenade comes to life at night with a market selling various items, including leather goods and clothing. Just behind the market is the nightly fun fair which is open during the summer months. The nearest beach is Punta Prima beach a 15 minute walk; it is a pleasant sandy beach with beach bars during the summer months. 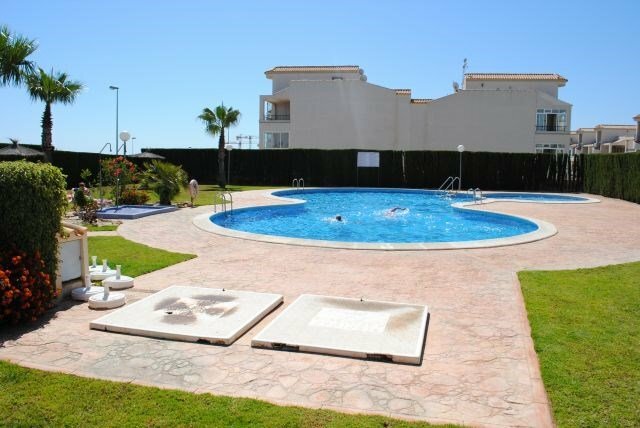 The property is ideally located to reach several other beaches La Mata, Playa Flamenca, La Zenia, Cabo Roig, Campoamor and Mil Palmeras, slightly further afield is the famous La Manga strip. Go-Carting along the N332 is a 10 minute walk, with karts for juniors, adults and Honda’s for those requiring greater speed. From Torrevieja harbor you can take a boat trip or day out. There is a water park at Torrevieja (Aquopolis) which opens June till September, there is also a smaller water park located approx 15 minutes away in Cuidad Quesada. Within a short drive from the property you have 4 Golf courses: La Finca at Algorfa, Villamartin, Real Club Campoamor, Las Rambles, all approx 10-15 minutes drive. Las Habaneras shopping centre located in Torrevieja just a 10 minute drive away, it’s a 3 story open air shopping centre and is home to clothing / sport shops (Inc Zara & H&M), perfumeries, Game, hardware shops and many more. Ample parking is provided, the first hour is normally free. The Ozone entertain complex is just across the road, with a casino, cinema, ten pin bowling and restaurants. There is a market everyday of the week on the Southern Costa Blanca. The 2 more local ones are Playa Flamenca on a Saturday and is a 5 minute drive, and Torrevieja market which is held on a Friday and is probably the largest market in the area. There are two bus services an hour to Torrevieja and a local bus service to the beaches and to Cabo Roig. There is a Taxi rank at Punta Prima and we can also provide a taxi number. A car is not essential when staying at La Cinuelica, but if you wish to explore to surrounding area we do advise that you hire a car. Alicante airport is approx 40 minutes drive and Murcia airport is approx 25 minutes drive. The apartment is located on the R1 phase of La Cinuelica.